SEC 2. That the General-in-Chief be authorized to organize the said slaves into companies, battalions, regiments, and brigades, under such rules and regulations as the Secretary of War may prescribe, and to be commanded by such officers as the President may appoint. SEC 3. That while employed in the service the said troops shall receive the same rations, clothing, and compensation as are allowed to other troops in the same branch of the service. SEC 4. 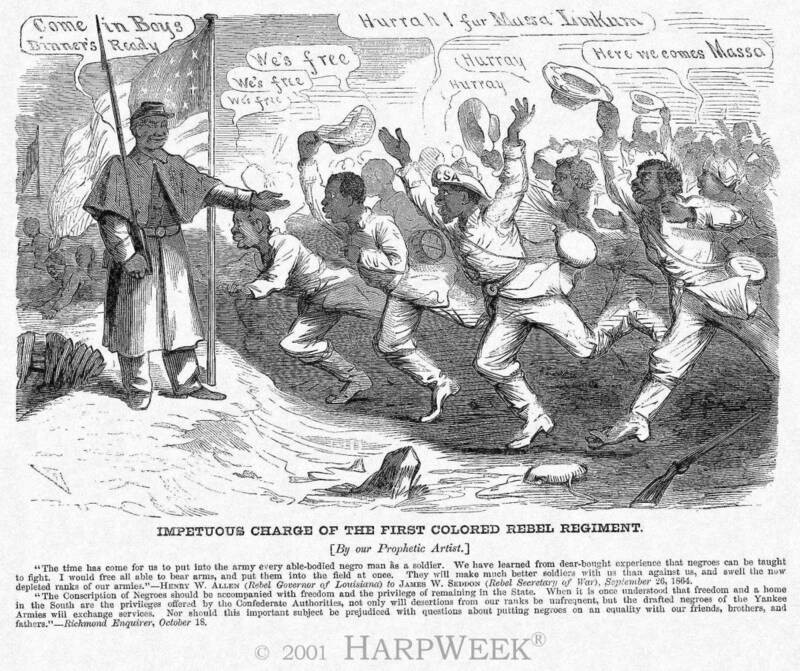 That if, under the previous sections of this act, the President shall not be able to raise a sufficient number of troops to prosecute the war successfully and maintain the sovereignty of the States and the independence of the Confederate States, then he is hereby authorized to call on each State, whenever he thinks it expedient, for her quota of 300,000 troops, in addition to those subject to military service under existing laws, or so many thereof as the President may deem necessary to be raised from such classes of the population, irrespective of color, in each State, as the proper authorities thereof may determine: Provided, That not more than twenty-five per cent. of the male slaves between the ages of eighteen and forty-five, in any State, shall be called for under the provisions of this act. SEC 5. That nothing in this act shall be construed to authorize a change in the relation which the said slaves shall bear toward their owners, except by consent of the owners and of the States in which they may reside, and in pursuance of the laws thereof.